A muscle strain is the stretching or tearing of muscle fibers. A muscle strain can be caused by sports, exercise, a sudden movement, or trying to lift something that is too heavy. 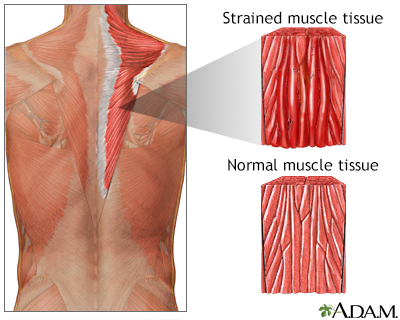 Symptoms of a muscle strain include pain, tightness, swelling, tenderness, and the inability to move the muscle very well.